Game Truck Special $249.00, Friday Through Sunday. 1.5 Hours of Fun! We Would Love To Support Your Favorite Inland Empire School, Non-Profit or Church! Looking to find a new way to bring excitement to your next California School Function, church event, youth group, summer camp or Kids Club? Need something new and unique for your Ice Cream Social, Fundraising Rewards, or School Open House? Kids will flock to our state-of-the-art video game trailer! We come to your school, church or camp and provide hours of gaming fun for kids of all ages. Up to 28 can play numerous video games while our friendly staff hosts the fun. Worried about game ratings? Don’t be! When you book your party, you select games that reflect the appropriate age range for your kids. Check out our games page for more information. We understand how to rotate our guests at different intervals so everyone has a great time. It’s the greatest entertainment idea for your fundraiser, school or church events, after-prom or safe graduation celebration! The kids will be impressed with the design of our video game party truck and trailer! We have the newest video game consoles, coolest games, comfortable stadium seating, high tech video and sound, and an amazing laser light show. Our mobile game theater is completely self-contained; all we need is a 55’ place to pull up and we can get the party started. Weekday Specials Starting at Only $245! Book Today to lock in this deal. Host a fundraiser with Us! Custom tailored to your event specifications. We can come to your School, Church, or any other location that our game truck can fit within our service area. Special tournaments types for your event! Your guests will have a great time and they'll be giving back at the same time! Contact us Today for more Fundraiser Options and information. Custom Tailored options for your event. 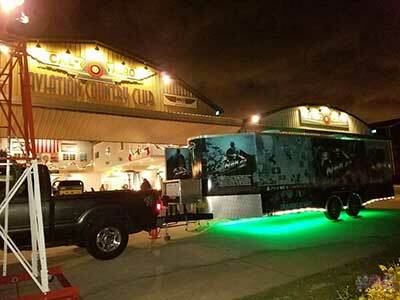 Upgrade the typical company picnic to an exciting Game Truck and Laser Tag party. We come to you at your office, park, or any other location in our service area. Contact New Age Gaming today for custom party options. Watch the game in comfort. Ultra comfortable Game Truck with Limousine style interior. Climate controlled interior with top of the line HDTV's and Surround Sound. Perfect for the Super Bowl, World Series, MMA, Boxing, and PPV Events. Contact us for more information on our Game Truck tailgating events!